Here are the Latina Bloggers. Presente! Latina Bloggers in the Meat Packing District: Melanie from Modern Mami; Ana, Spanglish Baby; me; Sylvia, Mama Latina Tips; Jeannette from Todo Bebe. Little more than two years ago, I wrote a post titled Looking for All the Latina Bloggers. The post was inspired by my attendance at a great conference that was sorely lacking in Latinas. I later determined, as best I could, that there were three of us out of a couple hundred. Que-que? Why so few? I already knew of lots of Latina bloggers, but they weren’t at the conference, and they sure weren’t getting the swag, ads, and corporate sponsorships our non-Latina blogger friends were raking in. But, we’ve come a long way. I just got back from Blogher, my first Blogher convention, and there were a few dozen Latinas that I knew of, and hung with. (Ay, que fun!) There also was an all-Latina panel, organized by a group called Latism and focusing specifically on creating content for Latinos, marketing to Latinos and reaching out to Latino blog publishers — the latter being of high interest to the non-Hispanic marketers and publicists in the session. We can be a confusing group of gente, after all. My trip, and that of six other Latina bloggers, was sponsored by Vme TV, a national network of Spanish-language programming that I respect (no half-naked dancing girls) and one of the first American companies to reach out to Latina bloggers in the same way other American companies have reached out to “mommy bloggers.” We were there to help educate and spread the word about Vme’s programming. Easy. Fun. A win-win for them, and for me, and the relationship will continue with their ads running soon on the Tiki Tiki Blog. Below, I’ve posted a round-up of links and stories on Latina bloggers that have come out of the Blogher event. Take a few minutes to spin through them and click through to the blogs listed. The voices are varied, the women interesting, and inspiring. I got my face all done pretty-like for a Yahoo! Shine interview on Reinvention. My video should load in a couple of weeks and I will update this post with it. Matt Lauer, a few feet from me, in the Plaza. The Today Show invited bloggers to attend a morning taping so we got up close with Meredith Viera, Matt Lauer and Al Roker in the Plaza and in the studio. They were gracious. We also got to go into the control room, which was a blast. One of their producers, the lovely Alicia Ybarbo, also interviewed me along with Melanie of Modern Mami and Ana of Spanglish Baby on the rise of the Latin blogger. There were a bunch of parties sponsored by big names. I went to a few and got a bunch of swag. So much that my amigas who know I often reject all the mierda laughed their rears off when they saw me with four bags of stuff…two bags were not mine, but I joked that my eyes were spinning red and white like a cartoon character. I have to say that my favorite things were hanging with friends, new and old, seeing the Vme folks and learning about their plans, the Today Show experience, an amazing brunch at the Loews Hotel (those people know class..and fancy cheese!) and filming a Spanish video spot for Spanx. Yes, I told the world about my underwear…and it was fun. The Explosion of the Latina Blogger from Wired Latinos. Latina Bloggers Courted by Spanish TV Network from She Posts. Bloguera Power from RL Public Relations. Latinas in Social Media: The Power of Familia and Sisterhood by Angelica Perez-Litwin at Modern Familia. Click here to see Roxana Soto from Spanglish Baby in the Yahoo! Shine Reinvention interview. It is in Spanish, but it looks like all, or most, of the others are in English. Roxana is a smart, passionate and dynamic woman and I was lucky enough to hang with her this weekend…especially at the Wax Museum on Time’s Square…what happens at the Wax Museum, stays at the Wax Museum though. Go Carrie! Kuddos to you and the other Mamás Latinas for getting the exposure and attention you deserve. Good work. Too bad Blog-him doesn’t work as well…Blog-él? Great post, Carrie! 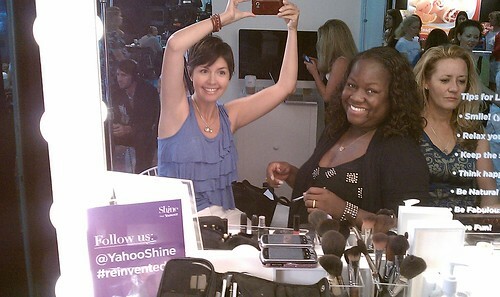 Looking forward to seeing your Reinvention video (saw Roxana’s already & loved it)! And you’ll have to post the Spanx video when you find it, too. What was the best swag you got at BlogHer? In all seriousness though, it was really nice to be able to watch from afar as all my hermanas took the conference by storm. People are finally getting the value of Latina bloggers, and I have a feeling the love is just getting started. I can’t wait for Blogalicious in Miami in October! You’re not kidding! Your eyes were spinning around like those of a cartoon characters. Can’t imagine what would have happened to you if there was some cajeta-party full of swag going on! Traigan a los bomberos! I completely remember you, now infamous, post with a linky calling out to Latina bloggers. I signed up, you visited SpanglishBaby, and now we’re Hermanas. I remember finding you on December 2008, I started my blog on April 2009, and met Ana and Dariela soon after. 2010 I’m so happy to see my latin a list had expanded to more than just a few!! I am enjoying and feel so proud hearing about all the great stuff you guys did!!! Way to represent! I’m a little bit jealous and a lotta bit proud. I’d love to go to BlogHer one year. So glad you were there and you look GORGEOUS! The lack of half-naked dancing girls is my favorite thing about V-ME. lol… Seriously, since a few of you told me about it earlier this year, I watch that channel quite often. You all look great in the pics. Glad you all had so much fun at BlogHer. Wish I’d been there, too. For some reason, hanging with you for 4 days, has got me saying “Mierda”(spell??) for everything!!!! Liz, sssshhhh, I don’t want everyone to know I have a foul mouth! Thanks everybody…it’s a movement, a jump forward, a very exciting place to be. And Unknown Mami, I am happy to know how gorgeous you are under that bag! I left most of what was given in party swag bags in the hotel room. 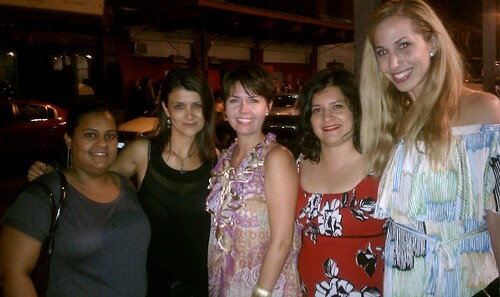 Carrie, I enjoyed meeting you and hanging with the hermanas at Blogher. It was a first time blogging conference for me & I was on cloud 9..well really cloud 99 enjoying the laughter, fun and sharing. Foul mouth?…shoot..I missed that and the Spanx underwear talk! ;) Where was I??? Carrie you can always make everything sound like so much fun, then again– you are FUN!!! and FUNNY! Sad to have missed the event, I hope I can join you ladies next year. Leslie Limon´s last essay ..It pays to go to school Or something like that! Fabulous! Just fabulous! Latinas are totally a force to be reckoned with. Sorry I missed all the fun. La proxima…. Thank you for the recent comments…Sorry I have been slow to respond. I am back in Nashville y estoy corriendo getting kiddo ready for school and easing back into the quiet life of Tennessee. The conferences are really wonderful, and mainly for the hangeo with people you like and admire…I am grateful for the connection — even if it most often is a digital one. @Leslie, mucho gusto! What an adventure you are on! It was so much fun hanging out with all of you…it’s too bad our group didn’t play the kissing game. jajajaja! Seriously, though, this year’s BlogHer was far better than last year and I know it was because of friends like you and the rest of our crew. Can’t wait to see how much better it’ll keep getting! Melanie (ModernMami)´s last essay ..Nominate Your School for Power a Bright Future Grant &amp Help Fund School Enrichment Programs!